Do you want to learn more on Aries and Cancer compatibility? Then you have just come to the right place. Check it out. Before talking about the Aries and Cancer compatibility, let’s learn a little more about each of them. Cancer is a very emotional sign and it needs a lot of affection to assert itself. Aries is quite energetic and has a temperament like the one of a warrior that allows him to live strong emotions. The couple formed by Aries and Cancer has little compatibility. Aries enjoys living great emotions and loves adventure. He is a very important person for the family and their interests are what matters the most for him. These two signs can actually complete each other, but they have to keep in mind that they have completely different interests. 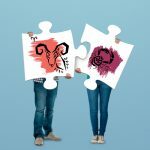 Aries and Cancer compatibility: how will the relationship work? Most of all, the Aries and Cancer couple has to learn to live with their own differences. Cancer has as one of his most important life goals to raise a family. And as this is a feeling that is deeply rooted, his life is basically based on it. Aries has different goals. Those born under the sign of Aries usually set goals for their own achievement. They have high professional standards as the basis for their personal satisfaction. The meaning of life is different for both Aries and Cancer signs. So, this couple should try to understand that their relationship can actually work. But for that to be true, clarifying their personal goals will help them overcome any difficulties that might show up. Cancer is a sign that has a very emotional temperament and this sensitivity makes him very weak. For this reason, the force of the sign of Aries can help develop a stronger personality in Cancer. Aries belongs to the fire element and Cancer is a water sign. The power of water can extinguish fire. For this reason, both signs, as a couple, should try to strike the balance in the relationship. A blend between the elements of Fire and Water might some strange. But, an Aries and Cancer couple can decide to work on their differences. They can agree to disagree and reconcile their differences. Aries expresses its communication very quickly. Cancer is emotional and very maternal. The communication must be established between the two in a delicate way. The rudeness of Aries can hurt the feelings of the sensitive Cancer. Anyway, this couple can have many conflicts in communication, if they do not learn to support each other. Aries likes to fight for their nature and Cancer has no emotional strength to live in constant fights. The intimacy of the couple formed by Aries and Cancer in the sexual aspect is a quite interesting one. The overwhelming passion of Aries will contrast with the romantic nature of Cancer leaving behind many differences. It is very important that these two signs keep in mind that the union between Aries and Cancer must maintain the relationship based on mutual understanding and they need to respect their own differences. The relationship could go through great tensions and confrontations, if they do not learn to leave with each other’s differences.